Output a sine wave with just resistors on your Arduino If you want a sine wave out you do not need a DAC . Just attach a resistive array to a set of pins . I used a bus terminator. Eight 1 meg ohm resistors tied together . Each pin provides additional current to the common point. By creating a loop of count up , count down nested loops you get 1-8 then 8-1 . 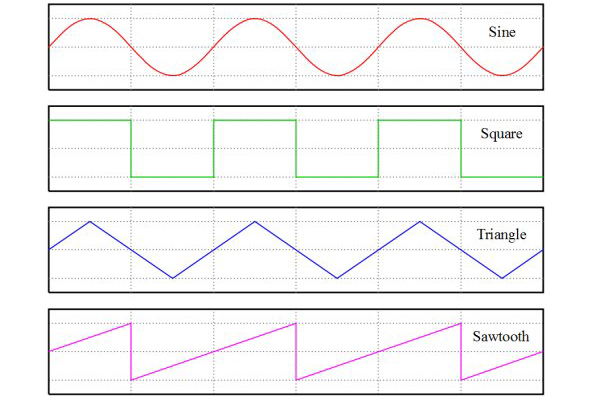 Using an oscilloscope you will see a sine wave. This method will provide almost no current . A high impedance amplifier will be required to make the output usefull. At full speed the rise and fall time will smooth the output . As you add delay between each step you lower the frequency but see a more stepwise waveform. The included code will demonstrate full speed and then a lower speed. I have also included a swept wave that adds delay then subtracts delay. I will comment out the sweep to make testing easier. The max frequency will depend on the system clock. I know a faster method is possible but this is easy to understand. good afternoon. If you remember your project, tell me. I'm not going to sketch ... Could you repeat on e-mail. I am very grateful to you. You did something different 'great'! Of course the code is such messed... You have made resistor-ladder DAC, but poor quality. And it doesn't look like sine wave, you could use sin() function, it takes a bit more memory, but generates sin-like numbers. And PWM with low-pass filter to take off the PWM part of the signal would generate pure sine with much less elements. With 16 resistors on the same 8 pins, arranged as an R-2R ladder, you could get LOTS more precision with the same number of pins. (Although unless u have very very precise resistors, about 6 pins would be the max). See wikipedia under "R-2R"